Scotty Sax is passionate about music. He has dedicated his life to it and it shows. He is regarded as one of Sydney’s leading entertainers and has performed alongside Australia's best musicians and Dj’s at hundreds of events. However, he does more than perform live, he is also a booking agent and has been successfully placing solo and duo acts at private events and public gigs for over a decade. Whatever your musical needs, Scotty has them covered. See some of the popular options below and make an enquiry. Fronted by Scotty Sax, Scotch & Soda is group that combines Dj, sax, congas, bongos, guitar and Australia's elite vocalists in any combination you desire. This group has a reputation for blowing the roof off a party. The Dj lays the foundation and then you can add as many flavours as you like. It's like taking your favourite drink and tricking it up. The video shows just some of the different combinations and talent you can have at your event. This team of musicians is ready to blow the roof off your next party. Checkout the testimonial page and the blog to see some evidence of what Scotch & Soda have achieved to date. Sydney premier live party band. They are master vibe-creators with an eclectic catalogue of guaranteed party starters. From a 5 piece through to a 10 piece. Scotty put this band together because it's hard to beat a good live band featuring horns and percussion. The Royals are the real deal. The winning formula is comprised of handpicked talent, matching diverse and in-demand Sydney musicians with the cream of Sydney’s vocal talent. The core musicians of The Royals have almost a century of experience between them, with technical acumen that has seen them play and collaborate with some of Australia’s most legendary acts. 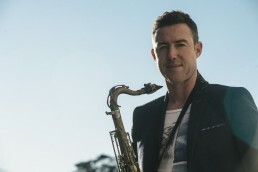 Scotty Sax made his name playing alongside local and international DJ's in the Sydney night club scene. Live sax when done right really lifts the energy in the room and adds flare and excitement to any event. The accompanying video shows Scotty Sax whipping the crowd into a frenzy at a wedding in Palm Beach. Whilst Scotty is a DJ, sax player and bongo player, he is available to play sax with your chosen DJ. The good news is, if he is unavailable, he can book you the perfect sax player, Dj or percussionist for your event. There's only a handful of guys that can really impress and Scotty knows who to hire. Congas, Bongo's, Djembe, and most drums fit perfectly over DJ music. Adding percussion is like adding icing to a cake. Sure the cake tastes good without icing but they taste sweeter with it. Percussion adds so much to the dance floor and Scotty knows the best in the business. In almost every style of music, percussion plays a pivotal role. The percussion family is believed to include the oldest musical instruments and certainly in Africa it has been used for a long time as a form of communication.Live percussion works so well with a DJ and bands because it adds a layer of excitement on top of the mix. It's visually appealing but more powerfully it speaks to us in a primal way that makes us want to dance. 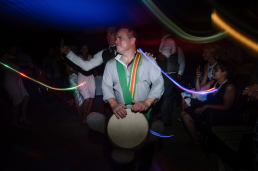 Congas and Bongos are instruments that draw the listener in and often leave the audience captivated under their hypnotic spell.Adding percussion will add a layer of excitement to your event. The vocalists Scotty works with are incredible. They are in demand and are at the top of their game. Working as backing vocalists for international touring artists, featuring on commercials, and placing highly in shows like the Voice, Idol and X-factor. Their talent combined with Scotty's multi instrumental skills will leave you thoroughly impressed. Scotty has been working alongside the cream of Sydney's vocal talent for 15 years and they compliment each other beautifully. All the singers have different strengths so it's worth discussing your event before choosing a vocalist with Scotty. Both male and female singers are options and The Royals and Scotch & Soda have access to these amazing singers. They will make your event come alive. Perfect for wedding ceremony's or small bars a solo or duo can be the perfect accompaniment to a significant moment or invoke a light hearted background mood. It's hard to beat the honesty of an acoustic performance. Stripping back the layers and hearing music in it's rawest form. The emotion of a song rises to the fore. There are so many different combinations. Guitar and vocals, piano and vocals, guitar and sax, solo pianist, spanish guitar, strings. Tell Scotty what you have in mind and he can help you plan the perfect combination for your event. Scotty has been booking acts at bars and hotels for over a decade. He is currently handling the music roster for the Royal Hotel in Leichhardt and the Sheraton on the park. Fill in the form below with details of your next event and we will get back to you. Include date, place and details.